If objects in the passenger compartment are stowed incorrectly, they can slide or be thrown around and hit vehicle occupants. There is a risk of injury, particularly in the event of sudden braking or a sudden change in direction. • Always stow objects so that they cannot be thrown around in such situations. • Always make sure that objects do not protrude from stowage spaces, parcel nets or stowage nets. • Close the lockable stowage spaces while driving. • Stow and secure objects that are heavy, hard, pointy, sharp-edged, fragile or too large in the cargo compartment. ■ To open: pull handle 1 and open glove box flap 2. 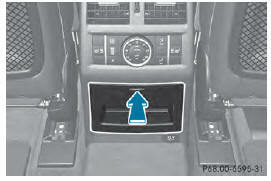 ■ To close: fold glove box flap 2 upwards until it engages. The glove box can be cooled and ventilated . 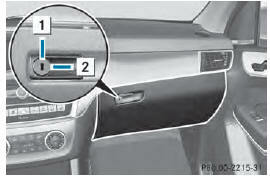 The glove box can be locked and unlocked using the mechanical key. 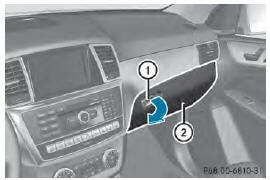 Partition 1 for stowing flat objects is located in the upper section of the glove box. It can be removed to increase the stowage space in the glove box. ■ To install: insert partition 1 and push it back until it engages. ■ To open: pull handle 1 up. Depending on the vehicle's equipment, a USB connection and an AUX IN connection or a Media Interface are installed in the stowage compartment. Media Interface is a universal interface for mobile audio equipment, e.g. for an iPod® or MP3 Player. 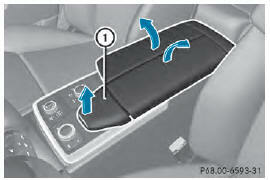 There is a removable stowage tray in the storage compartment, in which objects such as an iPod® can be stored. ■ To open: press marking 1. The eyeglasses compartment opens downwards. ■ To close: press marking 1 again and eyeglasses compartment returns upwards and engages. 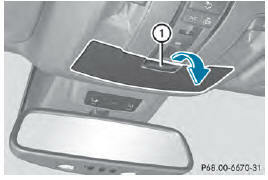 Make sure that the eyeglasses compartment is always closed while the vehicle is in motion. ■ To open: slide cover 1 forwards. ■ To open: briefly press the stowage compartment marking. Depending on the vehicle's equipment, there may be open stowage spaces above and below the stowage compartment.